As we enter in a season that is known for giving, our middle and high school students have had a greater focus on Civic Engagement. The current civic engagement initiative is “Celebrating the Unsung Heroes. Our first event in the series focused on Mrs. Gloria, our housekeeper at our Overtown Site. 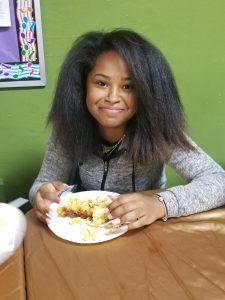 The TML youth worked hard and threw her a surprise “Appreciation Party.” In a very simple way, our students learned the power of selfless giving and the beauty of loving others in proximity. They learned that you don’t have to go far to show love and there are always people around you who deserve our appreciation. Our second initiative was to honor our local firefighters. Our students baked and decorated cookies and delivered them to two local stations near our Overtown Site. 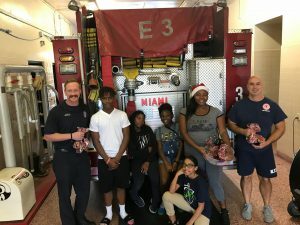 The Miami firefighters from Stations 1 and 3 were grateful for their treats! The firefighters even took time to show us around their homes away from home. Making the time even more fun, they put some of our students to work a bit. It was a wonderful exchange of love in the community and a great way to teach our youth to have a giver’s heart. Mycah walked up the steps of our apartment one night. When I opened the door she was wet from running through the rain and I quickly invited her in as we both embraced. In her hands, she held a gift bag and her usual big beautiful smile. She handed us the gift and told my husband Gavin and I that we needed to open the gifts in front of her so she could see our reaction. As I opened the gifts, I took out beautiful baby onesies full of colors, with dragons, cute sayings, and adorable prints. Since Gavin and I announced our pregnancy, these were some of our first baby gifts so the feeling of gratitude was especially powerful. But the clothes didn’t stop! More and more outfits, all thoughtfully selected. I noticed a card still in our bag. I eagerly reached for the card, but she stopped me. “…You have to wait until I leave to read that,” she said. Instead, we chatted about her upcoming summer job. She was looking forward to returning to work at Kids Across America—an inner city summer camp. This would be her second year to serve. Gavin and I were happy to congratulate her in person on her amazing grades in college (straight A’s! ), her leadership on campus as a Resident Assistant, and her involvement at her church. In my training as a social work major, there was always talk of boundaries, which indeed are especially important. Some understand boundaries to mean no contact with people you serve outside of work hours. As Christians though, I think there are significant times when we need to evaluate if our boundaries are keeping others from using their God-given gifts for the kingdom. Those of us who are used to giving, or “providing services,” often can feel very awkward receiving. But in the same way that Jesus said, “It is more blessed to give than to receive,” we cannot be selfish and always be the giver. We must also allow others the opportunities to serve and to give, even if that means we are the receiver. It is indeed a humbling place to receive. We don’t always know where we will see the Lord in our everyday lives. If we are open to both giving and to receiving, we may see Jesus through the interactions of people all around us. Amanda, far left, with a group of TML Alumni. • Volunteer to assist in sorting and preparing for our book giveaway at both sites. The scenario is a common one. Mom is in the grocery store line anxious to check out after enduring aisle and after aisle of her young child begging for everything from juice boxes to her favorite cereal. The candy is now the latest in a string of battles and Mom has had enough. If this scenario sends waves of memories I bet you wished you had an expert voice in your ear guiding you through this and other tough parenting situations. For parents in Overtown and West Homestead, that expert guiding voice is now a reality. Touching Miami with Love is excited to be partnering with the University of Miami’s Mailman Center for Child Development in an innovative evidence-based treatment for young children with emotional and behavioral disorders. PCIT stands for Parent-Child Interaction Therapy and improves the quality of the parent-child relationship by changing parent-child interaction patterns. This parenting education program includes a blend of parent education and parent coaching. During live interactions with their children, therapists coach from an observation room with a one-way mirror into the playroom, using a “bug-in-the-ear” system for communicating to the parents as they play with their child. Concluding each session, therapist and caregiver together decide which skill to focus on most during daily 5-minute home practice sessions the following week. Substantial research has demonstrated the effectiveness of PCIT for families with children between the ages of 2 and 12. In addition, PCIT has also been shown to work with children with autism spectrum disorders, chronic illnesses, and developmental concerns. So what does this mean for TML? 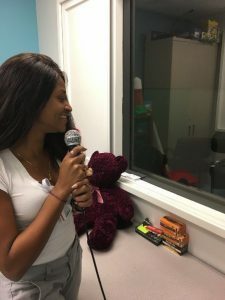 UM’s PCIT program rents two converted rooms at both TML West Homestead and TML Overtown sites as therapy space in order to provide PCIT services to families in our community. Given the large number of children we serve at our sites and the daily access of parents picking up their children from our programming, we were excited to answer University of Miami’s call for partnership for PCIT. They recognize we are trusted by community members and our programs and services are already regularly accessed by families. For families being served by TML and UM PCIT, the PCIT therapists provide after-school behavioral consultation to TML when children or youth are exhibiting significant behavioural difficulties that may be impacting their ability to learn or perform academically. 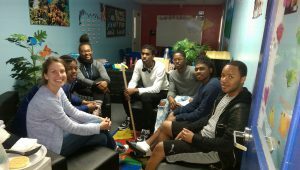 Additionally impactful for our children, when TML students in our year-round out of school program are exhibiting disruptive and/or aggressive behaviors or are at-risk for child maltreatment, our staff are able to provide a warm hand-off linkage approach to the PCIT therapist on site. The PCIT therapist then discusses services with the family and initiates the treatment engagement process. Therapy sessions like these would usually cost families thousands of dollars, but through this unique partnership and the funding support of The Children’s Trust our communities’ parents have free access to this most advanced intervention for parents. View a video of what an example of PCIT with UM looks like HERE. UM Therapist at our Overtown site coaches a parent as they interact with their child. We recognized the difference dinner could make over five years ago when we began providing meals each night of our youth programming as we re-created the family dinner hour. Not only were evening meals providing nutritious food to hungry youth in Overtown and West Homestead, it also created space for caring staff and volunteers to be a listening ear for young people. As we tried to match our resources with hungry youth, we found a new opportunity to engage the community at large and our project “Guest Chefs” was born. Individuals, church small groups, companies, and even families have joined us in providing one night of meals to our youth. We ask that groups do not just provide the meal, but stick around and chat with our youth too. It’s led to great conversations and open eyes on both sides of the table. One partner church has taken being a “Guest Chef” to a completely new level. Several times a year, a small group of people from the church gathers to create hundreds of servings of dinner. It’s part of their outreach event, City Serve, and Christ Journey Church has created some huge fans of their cooking! We’re grateful for all those in the TML Family who use their time, talent, and treasure to bless the children and youth we serve.